A plaque commemorating the historic first transmittance of sound over wire is located in front of the John F. Kennedy Building on Cambridge Street. 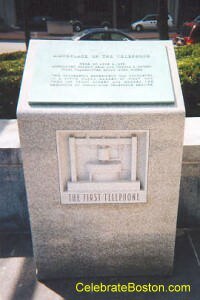 The marker reads, "Birthplace of the Telephone. Here, on June 2, 1875, Alexander Graham Bell and Thomas A. Watson first transmitted sound over wires. This successful experiment was completed in a fifth floor garret at what was then 109 Court Street and marked the beginning of world-wide telephone service." Mr. Watson had twanged a clock spring in their experimental telegraphic device, and Mr. Bell physically heard the sound on a 2nd device. On March 10th, 1876, at the same workshop on Court Street, Alexander Graham Bell shouted the famous words, "Mr. Watson, Come Here, I Want to See You." Thomas Watson, his assistant, surprisingly heard Bell's voice over their telegraphic contraption, and this event marks the first use of a telephone in history. Alexander Graham Bell (1847-1922) was an immigrant from Scotland. He worked in the field of vocal physiology, and as a teacher for the deaf. Bell moved to Boston in the early 1870s, and became a professor at Boston University. He was compelled to invent a device that would transmit sound over telegraph wires. At the age of 29, his dream was fulfilled when Mr. Watson came to his aid after hearing his voice through his experimental telephone.